Charolais met a consistent demand selling to a top of 8,000gns at the official breed society show and sale at Carlisle on Friday 23 November. Heading the trade at 8,000gns was Lynedraw Galaxy TI +37, SRI +31, sired by the 10,000gns Mullaghbane Ulliott and out of Baileybanks Connie. This 18 month old from R W and A J Jackson, Penrith, Cumbria was knocked down sold to J P and M J Davies, Brecon, Powys. A bid of 5,200gns secured the overall male champion Bassett Genie TI +24, SRI +24 for R W and M R Sowerby and Sons, Appleby, Cumbria. This 18 month old bred by J Atkinson, Malton, North Yorkshire, was by the 10,000gns Harestone Domino and out of a homebred dam. Two lots sold for 5,000gns. First came Alsnow General TI +27, SRI +37, bred by A R Lawson and Son, Newcastle, Tyne and Wear. This 21 month old by the 19,000gns Corrie Alan and out of a homebred dam was purchased by T H Vickers and Sons, Bishop Auckland, County Durham. Also claimed at 5,000gns was the 18 month old Millbridge Gladiator TI +24, SRI +28, purchased by H P Thomas, Brecon, Powys. Bred by J Hunter, Wigton, Cumbria, this one was by Burradon Talisman and out of Wigginton Aster. The reserve male champion Pedr Gringo TI +21, SRI +20 was secured for 4,000gns. Gringo, bred by P L Howells, Llanybydder, Ceredigion, was a 20 month old Thrunton Classic son and out of Hendy Thistle. He was knocked down sold to H Hughes and Son, Machynlleth, Powys. Bids of 3,800gns were made twice. Bred by J R G and R M Johnson, Hexham, Northumberland, Shankfoot Gladiator TI +60, SRI +54, was first through the ring at 3,800gns. This one was a 20 month old Blelack Digger son, out of a homebred dam and sold to R and A Buchanan, Gorbridge, Midlothian. 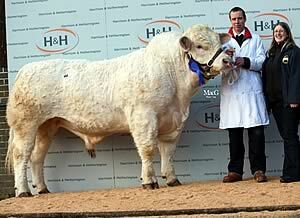 Burradon Grandduke TI +36, SRI +34 from Messrs Curry, Morpeth, Northumberland also made 3,800gns. This 18 month old sired by the 12,000gns Gwenog Banjo and out of a homebred dam was secured by R and E Hall and Son, Driffield, East Yorkshire. A call of 3,700gns was made for Gretnahouse Guardsman TI +31, SRI +26, a 20 month old by the 25,000gns Thrunton Camelot and out of a homebred dam. Guardsman was bred by A G Houston, Gretna Green, Dumfriesshire, and sold to J Warnock and Sons, Biggar, Lanarkshire. 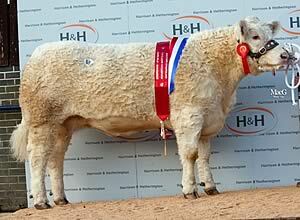 Holstead Emdeholly led the female trade at 5,500gns. The female trade was led at 5,500gns by Christmas Cracker champion Holtstead Emdeholly TI +26, SRI +28, by Burradon Talisman and out of a homebred dam. Bred by F, J and E C Andrews, Huddersfield, Yorkshire, this two year old sold in calf to Blelack Digger was knocked down sold to H P Whittaker, Tarporley, Cheshire. The same buyer also bid 3,100gns for Laverock Garland, a 15 month old heifer by Clonoulty Andraemon and out of a homebred dam from W Richardson and Sons, Kendal, Cumbria. Next came a bid of 4,300gns for Bleaklow Anastasia TI +22, SRI +13 and her six month old bull calf Bleaklow Hamilton, sired by Balthayock Aesop. This seven year old Gretnahouse Noel daughter out of a homebred dam was bred by T W Cox, Bakewell, Derbyshire and was purchased by Crowhall Farms, Hexham, Northumberland. The same breeder also sold Bleaklow Venus TI +16, SRI +16, for 3,600gns. Venus, an eight year old cow also by Noel and out of a homebred dam, was sold with her seven month old bull calf Bleaklow Hilton sired by Aesop, to Moorhouse Farm, Colby, Isle of Man. Gwenog Foxy TI +29, SRI +29 went for a call of 3,800gns. Bred by J S Howells, Llanybyther, Dyfed, this two year old Thrunton Classic daughter was out of a homebred dam and was bought by Nugent Estate, Portaferry, County Down. Nugent Estate also invested 3,500gns in the reserve Cracker champion Gwenog Gigi TI +37, SRI +35 from the same breeder. Gigi was a 21 month old heifer by Classic and out of a homebred dam. Pedigree Charolais Averages: 24 bulls, £3,640; 5 Cracker females, £3,843; 3 served heifers, £2,642.50; 4 maiden heifers, £2,021.25; 5 cows served and/or with calves at foot, £3,171.